There is a place in Poland where it is not only the wild Polish bison that lie in pastures green but also Orthodox believers, Catholics and followers of Islam. Offspring of the Tatar peoples, Byelorussians, Lithuanians and Poles chant their devotion to God, tradition and the beauty of the surrounding landscape. It is no coincidence that this area is the birthplace of so many magnificent artists. From here, they set out to the art academies in Gdańsk or Warsaw and to the exhibition salons of Venice and Kasel. 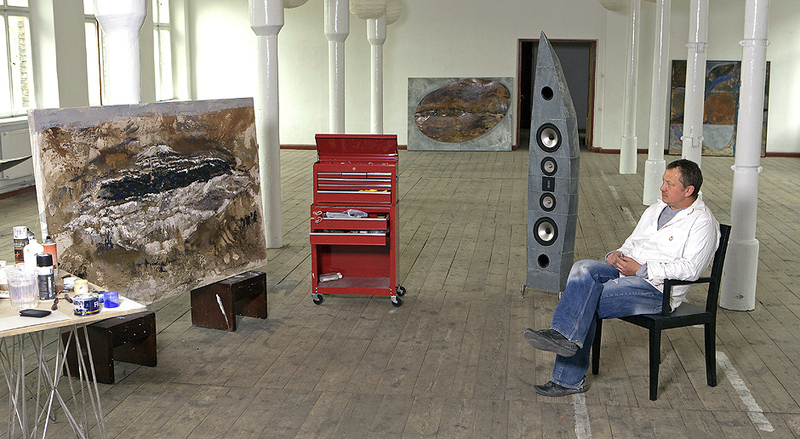 Tomek Krupiński is one such nomad of modern art. His monumental paintings objects, which he showed as part of his graduation diploma in painting at the Gdańsk Academy of Fine Arts foreshadowed the insubordinate nature of this particular artist. He is a painter, sculptor, designer of furniture and interior designer. I remember well the shoes he has made which have astounded many a man. For him, there is no difference between so called “high” and “applied arts”. Anything he touches metamorphoses into art – individual and unique, and recognisable all at once. He is a workaholic who loves partying and imbibing, he loves to indulge in the beauty which surrounds him while also leaving a trace of that beauty behind him. Each of his exhibitions is a sublime feast of painting, objects and furniture and – if the gallery space permits – monumental sculpture. His colossal “Canoes”, exhibited in the yard of the Ujazdowski Castle, the most exclusive exhibition space in Warsaw, now adorn the Northern Park in Sopot with their steel grace. It seems that he finds no difference between working in metal, stone, resin or wood. There is no difference for him if he works on a small form or on a large-sized monument, painting, shop interior, a club or a flat. He moves with unrestrained determination and fine precision from the design stage to perfectly worked detail, whether preparing shoes for Cyber-Frankenstein, the shuttles and cocoons of his beautiful lamps of organic shapes, or loudspeakers caged in cast iron for connoisseurs. Tomek Krupiński’s art is uniquely suspended between monumentality and sensuous intimacy, between brutality and elegance. It is the marriage of the Byzantine relish of the East and the sublime technology of the West. He graduated from The Academy of Fine Arts in Gdańsk, Faculty of Painting. Diploma (a space arrangement) at Kiejstut Bereźnicki’s atelier in 1994. He lives and works in Gdańsk, Poland.